Which prop will they see first? Which prop will they see second? How many minutes will elapse before they see prop number three? Which prop must they have discovered by the 30 minute mark or else they will be stopped by an NPC “May I zee yur paperz pleaze”? Which props are fluff, which props are essential to saving their souls? I tend not to use props when running D&D, but for horror or Paranoia games, I love them. They serve several purposes, and the order they are revealed is I think intertwined with their purpose in the game. 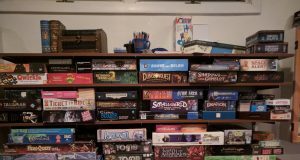 So here are some thoughts on the specific purposes or use-cases for props I include in my games. In my series of posts on my horror game Mazes and Monsters, I detailed how I made players select characters based solely on a name tent and a physical prop. For example, one name tent read “Jackie Goldstein, Concerned Parent” and the prop was a giant can of Aqua Net hairspray. The name, the title, and the prop were all chosen to evoke a certain stereotype. For everyone picturing Fran Drescher‘s character from The Nanny, you’re right on target. I really enjoyed this method of revealing the characters to the players without including game stats. I think it helps the players pick characters more based on potential roleplay opportunities. They are immediately thrust into visualizing what this character is like, and they bring that to the table after they choose. Of course it’s not always easy picking the perfect prop for each character. Jackie’s bottle of hairspray was very effective – the chauffeur hat for Theo the Chauffeur didn’t really reveal much more info than was already on the card. But who doesn’t love wearing a funny hat? Horror games often focus on investigation. 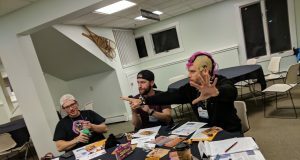 While this can often be the players thinking of where to look, rolling an “investigate” skill, and then me narrating the outcome, it’s much more fun when I can just hand them a prop. Especially if the prop has hidden information that the players must deduce from the prop. Obvious cases here are things like a map. For Mazes and Monsters I also had student course cards listing each missing student’s weekly schedule. Comparing these the players found patterns (hmm, they all have this one same class) which lead to further investigation. I’ve also had props stand-in for more traditional mechanics. For example, in a Paranoia game I ran I had a big table of items for the equipment guy. I then handed the player a giant military sized duffle bag that was completely full of variously sized empty boxes, each with a number written on the inside. During the game the equipment guy could rifle through the bag, open a box, tell me the number, and I’d inform him what piece of equipment he pulled out. This of course only really makes sense in Paranoia, where it makes sense for the player to be given a huge selection of unlabeled equipment with no instructions whatsoever. It was a fun way to introduce more chaos, and always funny to watch that player heave up the giant bag. And then of course there are props that serve no purpose other than to set the mood. At the top of this post is a picture of some silly fake mustaches. I brought these to every game of Mazes and Monsters I ran, because it was set in the 80s, so of course everyone had mustaches. I just tossed them on the table and said “Since it’s the 80’s, if anyone would like a mustache please help yourself.” Sadly, because it’s now the 2010’s, everyone has full beards so I never had many takers. I guess that probably about covers it. Ryan hits on another interesting point though – when do I hand out these props? Some obviously come at the start of the game, such as simple mood setters or the character insight props. Others are tied to specific events, such as handing out a map discovered at a particular location. That said, I’ve always felt that horror games are all about pacing, so thinking ahead of what the pacing of the prop hand-outs should be is a very good idea. When I’m writing I often break my game down into sections – acts or parts or whatever. It may be worth looking at each one to make sure it has a prop in it, so there’s a good flow of props through the game. Though, maybe this will just lead to the accumulation of yet more props, which is really not what I need right now. I need to finish writing this beast. Perhaps once I have all content written up, I will come back and do a “prop pass” to make sure the flow of props is spread out in the game. Three-circle venn-diagram on the floor made of hula-hoops with the props collection. Send pics. Sadly, I’m pretty lacking in the hula-hoop department. I will post more details here after I’ve run the game through its paces a couple times. For now though I have to remain a little cagey on the details — a lot of my future players read this blog!